Apple has become the latest tech giant to prioritize digital wellbeing. 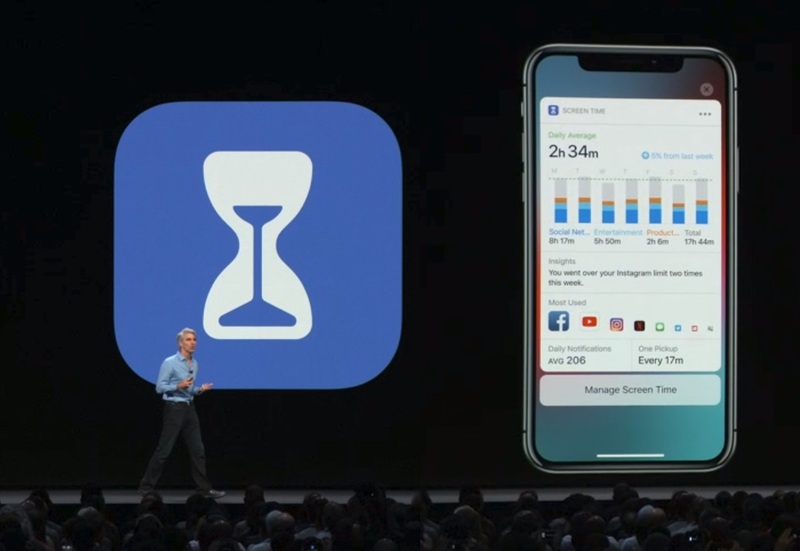 At its Worldwide Developer Conference this morning, Apple announced a series of new controls that will allow iOS users to monitor how much time they spend on devices, set time limits on app usage, control the distraction of notifications, and control the device usage for their children. The addition of these features was previously leaked by Bloomberg, but the details on how they worked wasn’t yet known. In the upcoming version of the iOS 12 software for iPhone and iPad, Apple will include a series of features focused on digital wellness, starting with an upgraded Do Not Disturb feature that will help people who tend to look at their iPhone at night, and then find themselves distracted by the excessive notifications. With Do Not Disturb during bedtime, you can configure so your iPhone doesn’t show your notifications when you look at your phone at night, during hours you customize. The feature will also help you at other times of the day, too – for example, if you don’t want to be interrupted during class or a meeting. In Control Center, you can configure when Do Not Disturb will end, as well. Meanwhile, Apple is also introducing better ways to manage your notifications. Siri will even suggest to you which notifications you should turn off, based on which apps it knows you’re no longer using. Siri can also prompt you to turn notifications off entirely or just delivery them quietly. But even more useful, perhaps, is support for grouped notifications. That means notifications will not just be grouped by app, but also by topic and thread. You can tap into these groups and look at those from a particular app, and you can triage all those grouped notifications with a single swipe. Another part of Apple’s digital wellbeing features includes reporting over how you spend time on your device. This involves a weekly activity summary that shows you how you used your iPhone or iPad during the week. This full activity report will show you how much time your spending on your device and in apps, and how that breaks down per day. You can also see which apps are sending you the most notifications, so you can make better decisions about which apps’ notifications you may want to disable. And another feature lets you set time limits for apps that take up your idle time, which you’d like to be more thoughtful about, in terms of your usage. When your time is about up, you’ll get an alert, and when the time is up, a new “Times Up” screen comes up. You can extend your time, if need be, Apple notes, but you’ll still get nudges to take a break. Other new features are aimed at families who want to control screen time for their children. This includes an activity report for parents about their kids’ device and app usage, and the option of creating allowances for kids. A “Downtime” option will help kids to unplug, and parents can limit app usage by category or individual whitelisted apps. That way, parents can make sure critical apps will still work even during downtime, like the Phone app or Books. However, during Downtime, notifications from apps aren’t displayed, and a badge appears on apps so kids know they can’t currently be used. A Screen Time limit lets parents block off time when the device can’t be used at all, like around bedtime. This feature works with Family Sharing. All this is configured by parents remotely from their own device, says Apple. Apple is not the first tech company to rethink its responsibilities around device addiction. At Google’s developer conference just a month ago, the company introduced its own set of time management tools for Android users. Its tools help users track screen time and app usage, and include new features like a “shush” mode which turns on Do Not Disturb by flipping the phone over, and a “wind down,” color reduction mode for bedtime. For example, Facebook earlier in 2018 changed how its News Feed operates to reduce users’ time spent on the site in favor of wellbeing. And Facebook-owned Instagram just introduced its first time well spent feature, by informing users “you’re all caught up” when they’ve viewed all the new posts. The idea is that people don’t know when to stop when in comes to devices and apps, and lack information and tools that can help them make decisions about how much time they want to spend on devices, versus how much time they’re actually spending. The movement around digital wellbeing is a fairly recent shift for Silicon Valley, where companies until now have encouraged the design of software and apps that continually engage and addict users, without considering the psychological cost. Stress, anxiety, insomnia, distracted thoughts, inability to concentrate, emotional issues and more have been the result of these companies’ desire to keep users glued to their devices. But now some early tech execs are pushing back. Former Facebook president Sean Parker has openly worried about what social media was doing to kids’ brains and admitted Facebook was designed to exploit weakness in the human psyche to addict users. A former Google exec Tristan Harris launched a coalition of technologists and activists called the Center for Humane Technology, which aims to encourage the implementation of new design principles that help to put users back in control of their technology usage. As the rumblings around digital addiction escalate, other trends are emerging as well – like the booming business for “mindfulness” apps and those that help users practice self-care, which includes putting the phone down and taking care of our other needs. Some have put this into practice in an extreme way, as of late – Simon Cowell said he actually gave up his mobile phone entirely, and feels so much happier as a result. With its own new tools, Apple has the ability to set a new tone for the industry as a whole, given how others copy its designs – right down to the iPhone X notch. But in this case, mimicry would be a good thing. The creation of a new culture around technology usage which stops measuring “time spent” and repeat sessions as metrics of success, would be something that ultimately benefits everyone.